In love, a couple of Aquarius woman and Scorpio man are waiting for a very difficult relationship, but you can definitely say that they will successfully cope with the problems. Despite the mismatch on many issues, they still can overcome difficulties. Their happiness in this case, depends solely on themselves. Man Scorpio is moderately emotional person. A balanced, active man, strives for material goods. Not lazy, resourceful, judicious. Can think creatively, logically, calculate steps, plan, analyze their actions. Do not mind dreaming, dreaming and for a long time "hanging in the clouds". His eccentricity, exceptional individuality attracts women. Not an exception and a woman Aquarius. She is wise, thoughtful, she has cunning, agility, endurance. She is successful in life, her fate is favorable, but she also makes a lot of efforts for a prosperous existence. 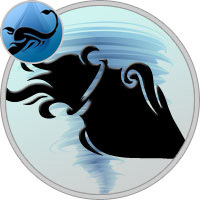 Aquarius - contact, sociable woman, takes decisions with lightning speed, is firm and confident in her actions. Never fall into complete dependence on a man, will always keep at least a minimum distance. In domestic affairs, the woman Aquarius sees boredom and routine, it is unlikely she will become a diligent mistress. She will gladly give up this role and put her on someone else. The Scorpio man appreciates comfort and comfort, but in this union he will have to support himself. Aquarius is a sociable woman, there are always a lot of fans around her. Even at a respectable age this fact will take place. Scorpio jealous now and then will be nervous, arrange a review of the "flights", but Scorpio himself also does not differ by constancy, in his biography many romantic stories and hobbies. Scorpio loves women very much and, despite their age, they will always attract him. Aquarius is not jealous, this is the only woman for Scorpio, able to "turn a blind eye" to a man’s intrigues. Scorpio will gladly promote the advancement in the professional sphere of his companion. His advice is really valuable, his instructions should be heeded. By nature, the Scorpio man has an incredibly sensitive intuition. The Scorpio man is inclined to conceal and accumulate grievances, he is vindictive. Sometimes to surreptitiously vex or go against it, it’s in his spirit. Avoid conflicts will help only dialogue in which all the terms of the relationship will be indicated. Suppose that if a man provides a material basis for the family, regulates the issues of life, then the woman Aquarius should be loyal, soft, protected from obsessive admirers, and engaged in children. The approach must be constructive and adequate, then the couple learns happiness, understanding of the ideal family. According to the compatibility of Aquarius women and Scorpio men, despite the fact that this union can be very problematic, in the opinion of others they live together interestingly and happily. Looking at this pair, you can recall the famous aphorism: "What does not kill me, makes me stronger and stronger." The Aquarius woman is a supporter of free relationships, so the proprietor of the Scorpio man is very difficult to understand her. These partners have a big difference in temperament and character, in views and opinions, in beliefs and worldviews. For Scorpio men every detail is important. He sees everything in everything and everything and does not want to do anything just as he would, by the way. If he married, then it must be for life. A woman-Aquarius can not appreciate all the charm of marriage ties. Despite the fact that the Aquarius woman is quite decent and will not change her husband, she still tends to lead a free way of life, and does not want to do household chores, stand at the stove or wash socks. All this does not fit into the ideas of the Scorpio man about the ideal wife and mistress of his house. Therefore, the home is likely to turn into a battlefield, where mutual reproaches, resentments and claims are raging. Of course, all this can be avoided if Aquarius and Scorpio learn patience and will seek a compromise in everything. In an ideal Aquarius woman and Scorpio man pair, relations are based, first of all, on mutual respect and love. That’s what helped them build a harmonious relationship, because it was not immediately. They had to go through many difficulties before reaching mutual understanding. When this couple appears in society, they immediately attract attention. Both are bright, strong personalities. A pair of Aquarius-Scorpio compatibility in each other find reliable support and protection. Scorpio man in communication very often uses caustic expressions, and Aquarius, one of the few who is not afraid of the shrewd scathing remarks of the Scorpio man. She has an unusual sense of humor, besides, she can not be convicted of anything, for which she could blush. She is also able to sincerely rejoice at the attacks of the Scorpion man, provoking his reaction to laughter and completely discouraging the desire to "pin". Her sincerity, honesty and charm, help to establish relationships with this man. The main problem of compatibility of the Aquarius and Scorpio zodiac signs — different temperaments. The Aquarius woman is extraverted. She needs a lot of communication for her happiness, many friends and impressions. A Scorpio man — more immersed in himself, he is quite enough to communicate with his own inner world and his beloved woman. He is extremely jealous and considers the woman his property. He will start to manipulate an Aquarius woman, to pressure her, forcing him to obey his rules of the game. Woman Aquarius is an experimenter and at first can go to all the evenings to spend at home and to be in the kitchen. But, soon she will understand that this is not for her, but it will be difficult to escape from the pressure of the Scorpio man. The Aquarius Woman is freedom-loving and will not give up her freedom even for the sake of love. Therefore, the Scorpio man communicating with her, trying to be jealous and hold the wind. Yes, a loving Scorpio man is capable of much for his beloved, but his character will always remain with him. According to the horoscope of compatibility of Aquarius and Scorpio, so that in their family there was harmony, partners should periodically frankly communicate with each other. Gradually you can explain to the Scorpio man that you need to respect other people’s habits and interests. Very help to convince non-standard arguments, books and training on psychology. You can invite a Scorpio man himself to draw a psychological picture of a couple. Over time, when he thoroughly thinks everything over and analyzes the situation, he can come to the conclusion that everyone has rights, and they do not need to encroach on them. Patiently work in this direction, and the Scorpio man will get used not only to protect you, but also to respect your decisions. Remember that such conversations can and should be repeated. A Scorpio man can not be remade. And you can not prove to him that he has no reason for jealousy and doubt. Also, the Aquarius woman should understand that the proprietary behavior for Scorpio is also natural, as for you your freedom.